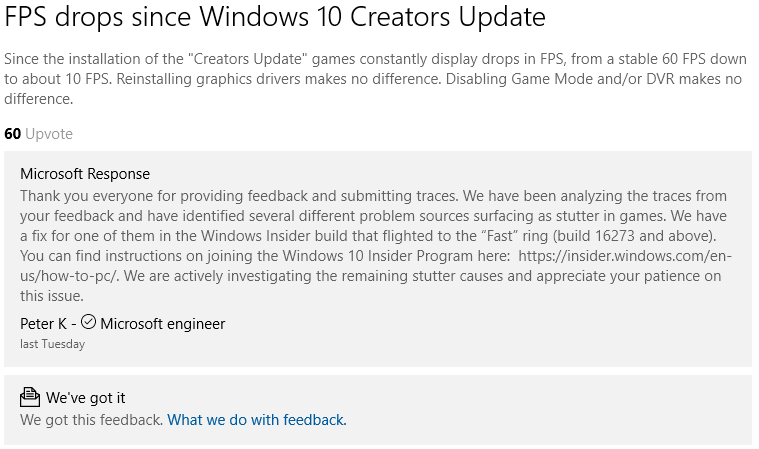 Microsoft has confirmed that gamers reporting strange stuttering since the release of the Windows 10 Creators Update earlier this year have not been imagining the issue, releasing a fix for at least one of the root causes to Windows Insiders and actively investigating others. Part of Microsoft's commitment to biannual Windows feature updates, the Creators Update launched in March this year with a range of new features including early support for 3D modelling and virtual reality applications built directly into the operating system. The release also brought with it 'Game Mode,' a new feature which was claimed by Microsoft's Mike Ybarra to 'optimise your Windows 10 PC for increased performance in gaming.' The twist: Since the launch of Windows 10 Creators Update, gamers have been reporting poor performance and stuttering frame rates in titles which had run just fine under previous Windows 10 builds. Thus far, Microsoft has not offered a schedule for when the fix will be available to those not enrolled on the Windows Insider programme, nor whether such an update will be made available before the next major update to be released in October. Ran for a couple of weeks past deadline. MIT Licence so it can live on.